Shalimar Buffet. Hand carved mughal style. Anglo Indian style buffet. High end furniture. Shah Gilani, ASFD, designed the Shalimar Buffet as a tribute to the beauty of this garden. 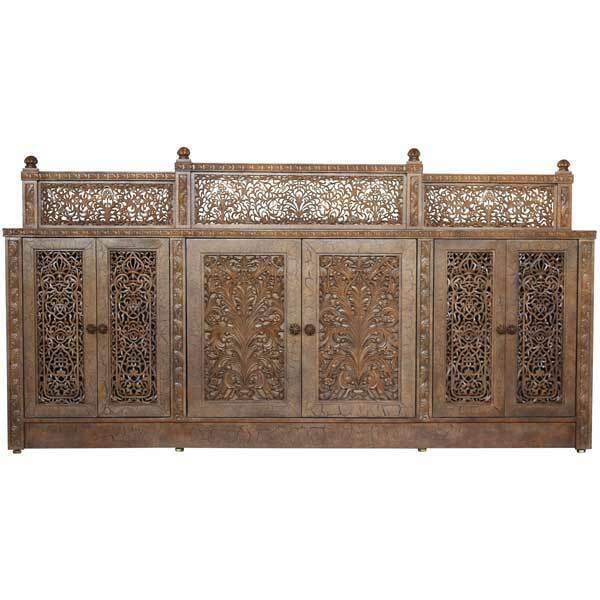 Entirely hand-made in selected rosewood, this cabinet is the epitome of pierced carving. The doors have self closing hinges and the shelves are melamine lined. Multiple polished bronze glides are provided which also serve as levelers – a useful feature when the floor is uneven. The cabinet is offered in a variety of finishes. Custom sizing is available.